Before Christopher Columbus discovered and imported tomatoes, cheese was the most used condiment for pasta. Pepper and eggs came afterwards, especially in Southern Italy, and combination with garlic and oil was also discovered; in Sicily the most common ingredients were saffron, sardines and fennel, whereas pesto was widespread in Liguria. Rustichella d’Abruzzo offers the recipes of the best condiments handed down from mother to daughter, following the farming tradition and respecting the seasonality of products. All production processes are well monitored and the use of extra virgin olive oil of the Aprutino Pescarese area makes them irresistible even to season delicious bruschette or to complete hot and cold starters. Made through an innovative production process with no pasteurization, which makes it top quality even in its flavour. Perfect for preparing a fresh summer first course, for example combined with Rustichella d’Abruzzo Pizzichi di Farro. The perfume of basil adds the final touch even to your seafood-based and meat-based dishes. To be consumed at room temperature or slightly heated at low flame. After opening keep refrigerated and consume within 3-4 days. Product for 1-2 people. Made through an innovative production process with no pasteurization, the black olive cream has an intense and firm taste. 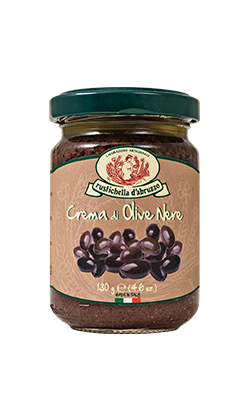 It is perfect as condiment for bruschette and starters, with a bit of Rustichella d’Abruzzo PrimoGrano INTOSSO extra virgin olive oil. To be consumed at room temperature or slightly heated at low flame. After oening keep refrigerated and consume within 3-4 days. Product for 1-2 people. Made through an innovative production process with no pasteurization, the green olive cream has a delicate taste with a pungent aftertaste. 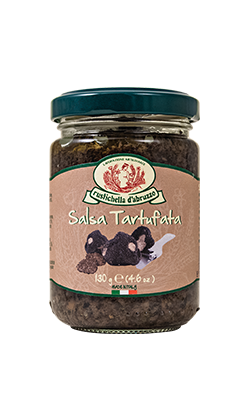 It is perfect as condiment for bruschette and starters, with a bit of Rustichella d’Abruzzo PrimoGrano INTOSSO extra virgin olive oil and also with some Rustichella d’Abruzzo short types of pasta. To be consumed at room temperature or slightly heated at low flame. After oening keep refrigerated and consume within 3-4 days. Product for 1-2 people. Made through an innovative production process with no pasteurization which enhances the quality of ingredients, this sauce has the plus of the top quality truffles from the Molise region and the extra virgin olive oil of Aprutino Pescarese area that make it perfect for Rustichella d’Abruzzo egg pasta out of “Sapori della Natura” line, such as Laganelle allo Zafferano and Laganelle al Tartufo. For the lovers of this refined tuber. To be consumed at room temperature or slightly heated at low flame. After opening keep refrigerated and consume within 3-4 days. Product for 1-2 people. 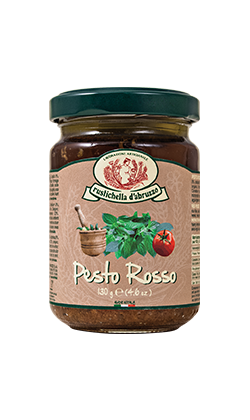 Made through an innovative production process with no pasteurization which makes it top quality even in its taste, the red pesto is made with dried cherry tomatoes, fresh basil and nuts, with the plus of the extra virgin olive oil of Aprutino Pescarese area. We recommend it with Rustichella d’Abruzzo PrimoGrano Spaghettone. To be consumed at room temperature or slightly heated at low flame. After opening keep refrigerated and consume within 3-4 days. Product for 1-2 people. 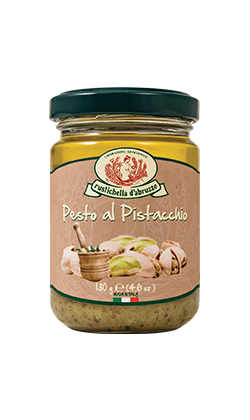 Made through an innovative production process with no pasteurization which makes it top quality even in its taste, this type of pesto is made with the refined pistachios of Bronte di Catania, with the plus of the extra virgin olive oil of Aprutino Pescarese area. We recommend it with Rustichella d’Abruzzo TRITICUM 100% Abruzzo Farro pasta. To be consumed at room temperature or slightly heated at low flame. After opening keep refrigerated and consume within 3-4 days. Product for 1-2 people. 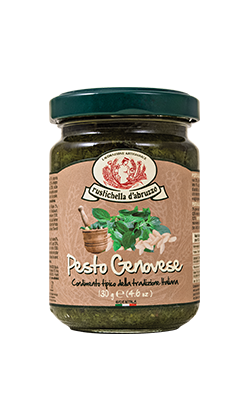 Made through an innovative production process with no pasteurization which makes it top quality, the classic pesto “alla Genovese” produced by Rustichella d’Abruzzo tastes exactly like the fresh homemade pesto, a feature that makes it stand apart for its quality and tastiness. The plus of the extra virgin olive oil of Aprutino Pescarese area allows it to be a fundamental ingredient that cannot be missing in your kitchen. We recommend it with Rustichella d’Abruzzo Fusilloni Giganti. Combined with ricotta cheese, it represents also a very good filling for Rustichella d’Abruzzo Cannelloni. To be consumed at room temperature or slightly heated at low flame. After opening keep refrigerated and consume within 3-4 days. Product for 1-2 people. 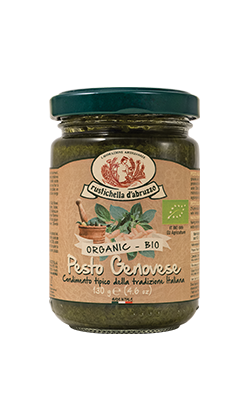 Made through an innovative production process with no pasteurization which makes it top quality, the 100% organic version of the classic pesto “alla Genovese” produced by Rustichella d’Abruzzo tastes exactly like the fresh homemade pesto, a feature that makes it stand apart for its quality and tastiness. 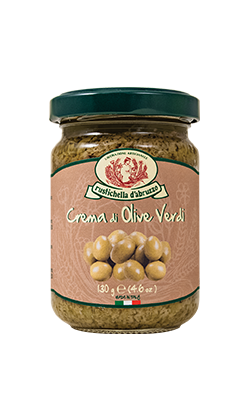 The plus of the extra virgin olive oil of Aprutino Pescarese area makes it perfect when combined with Rustichella d’Abruzzo TRITICUM line, particularly with Saragolla wheat pasta. To be consumed at room temperature or slightly heated at low flame. After opening keep refrigerated and consume within 3-4 days. Product for 1-2 people.